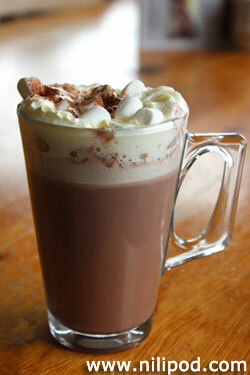 The perfect hot chocolate is a quick and easy thing to make. We've talked about this recipe before on our podcast and even made a YouTube video about a Christmas version, where we added some marshmallow snowmen to the top. There are lots of different ways that you can make your hot chocolate and it will only taste as good as the ingredients that you use. For a creamier taste, we far prefer to use full-fat milk, rather than skimmed milk. Also, we like to add in a generous spoonful of a good-quality cocoa powder, preferably Bourneville or a similar make, which adds a really strong chocolatey flavour and actually contains much, much less sugar than actual hot chocolate powder. For an additional hazelnut taste, mix in a spoonful of Nutella spread, and when it comes to your toppings, small marshmallows, a swirl of spray cream and a dusting of cocoa powder will be sure to make your drink seem extra special. 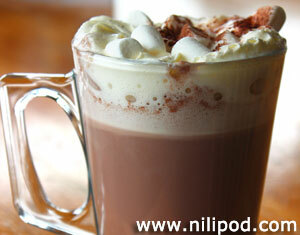 Add the hot chocolate and cocoa powder to a mug and mix with a little of the milk to form a paste. Pour in enough milk to just about cover this paste and warm in the microwave for 30 seconds. Remove your mug from the microwave and stir once more. By warming it in this way, it will make the powder dissolve better and you will end up with a smoother drink, without any annoying lumpy lumps. Pour in the rest of the milk so that you fill up your mug to roughly 2 cm below the rim. Warm your delicious hot chocolate drink for a further two minutes in the microwave and then stir it thoroughly, before squirting on a mountain of spray cream and a generous sprinkling of marshmallows.